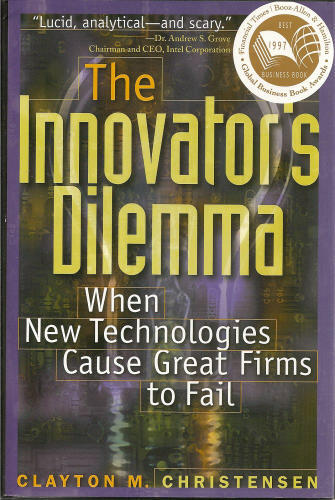 I was recently reacquainted with the book The Innovator’s Dilemma by Clayton M. Christensen (Harvard Business School Press, 1997). This classic work presents example after example of well-managed, successful companies across various industries, which failed to recognize the future impact of, and subsequently struggled to respond to, newer disruptive technologies. A typical disruptive technology is initially designed to service a small emerging market, which appears less profitable to the established companies. Over time, the new technology matures to a level where it can move “up market” and become quickly adopted by the larger market before the established companies can respond in kind. A fresh read on my electronic reader (how’s that for an ironic example of a disruptive technology!) reinforced what Christensen describes, that companies did not fail because of arrogance, laziness or poor management. They failed exactly because of the fact that they were well managed. While we naturally tend to focus on more recent disruptions in computer technology, retailing and manufacturing, not all lessons to be learned from history come from modern technology. Buried in a footnote is a mention of Robert Fulton’s steam powered ship, which was initially dismissed (aka “Fulton’s Folly”) with the thinking that it would never compete with the dominant ocean-going sailing ships of the time. But what the steamship could do well was efficiently navigate the smaller inland waterways and reliably move in the absence of a steady breeze. The inland waterway market was much smaller than transatlantic shipping, but sufficiently large enough for the steamship makers to perfect their technology. Over time, steamship performance improved to where they could circumvent the globe. They were able to move “up market”’ and successfully penetrate transoceanic shipping. By then it was too late for the sailing industry, and not a single maker of sailing ships survived. The steamships ruled the seas. So how do we learn from and (hopefully) avoid the mistakes from the past? It’s easy to say and hard to implement, but we need to deliberately innovate for both purposes—for today and for tomorrow. Not all innovations are as disruptive as the steamship was to the sailing industry, or the PC to minicomputers and mainframes. What may appear to be minor iterative improvements can sometimes greatly optimize current functionality. Larger architectural advancements can significantly improve the performance of existing products and systems. These so called “sustaining” innovations should always be a necessary component of development focus. In fact, here at TT we spend the majority of our time building these types of sustaining innovations, e.g., working to make messages travel faster and safer, constantly looking to better streamline the user interface, etc. The positive tangible results of these improvements help produce the financial resources and capabilities that a company needs to continue to compete and grow within the marketplace. Without them, a company is doomed to slowly decay. To identify nascent blips before they mature into a new dominant trend, a non-insignificant amount of effort also needs to be budgeted to focus specific time and research on areas away from the current tasks. Some companies have formalized this process such as Google’s 20 percent time and the McKinney Ten Percent. Intel’s internal resource allocation process is weighted towards each product’s gross margin as a way to automatically self-correct and allocate more resources to the growers and less to the decliners. Decisions to allocate precious time and resources amongst competing priorities of sustaining work must be balanced against undertaking more risky “skunkworks” R&D-type projects, which may or may not bear fruit. For example, TT is actively exploring cloud and web technologies, in ways that may (or may not) eventually prove beneficial. We tend to think that they will be successful, but actually it really doesn’t matter what we think, as ultimately the marketplace will determine the outcome. It is very tempting to easily dismiss these side-line projects, since they logically seem at the time as frivolous endeavors that may never be profitable. Until one is…at which time the firms that either ignored or starved investments in those areas find that they suddenly do not have the capabilities necessary to compete in the new area, and quickly lose market share to the newcomers. It is easy to agree with the obvious statement that the future winners are not known in advance. But it is much harder intellectually for smart, customer-focused business people to accept Christensen’s claim that not only are the future winners unknown, they are unknowable. So hedge your bets to protect you from yourself. Continue to innovate on what you know in order to grow with your current clients. But do more than just “keep an eye out” for new ideas, and purposely structure a portion of your efforts—research, planning, prototyping—on small, OK-to-fail side projects. The end goal is to improve the chances that you participate as a future disruptor.